You may be wondering what makes a Thai wonton different from ordinary Chinese wontons. Like many foods that make up modern Thai cuisine, these wontons have been adapted from their Chinese cousins. In this recipe we infuse the filling with the distinct Thai flavors of lemongrass, kaffir lime leaf, coriander root, and garlic, and serve them with a sweet, sour, and slightly spicy dipping sauce. What's in our Thai Style Fried Wonton. 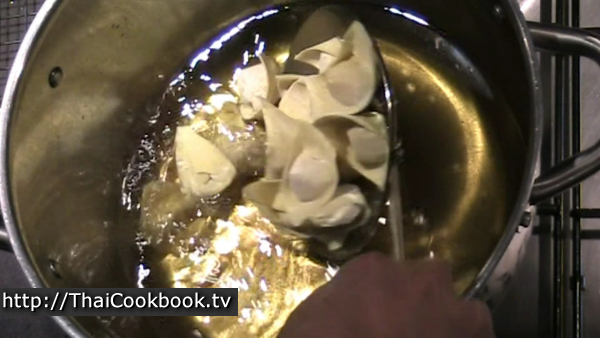 How we make our Thai Style Fried Wonton. 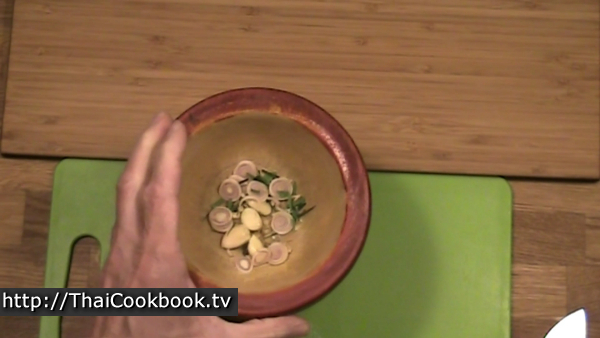 1) Grind the lemongrass, kaffir lime leaf, coriander root, garlic, and green onion into a fine herb paste. 2) Add the herb paste to the ground chicken together with tapioca starch, white pepper, fish sauce, and sesame oil. Mix it all up very well. 3) Fill the wonton wrappers with 1 teaspoon of filling and fold them tightly. 4) Deep-fry on low heat for about 5 - 7 minutes. 5) Serve with a dipping sauce made from Thai sweet chili sauce, lime juice, sesame seed, and cilantro. 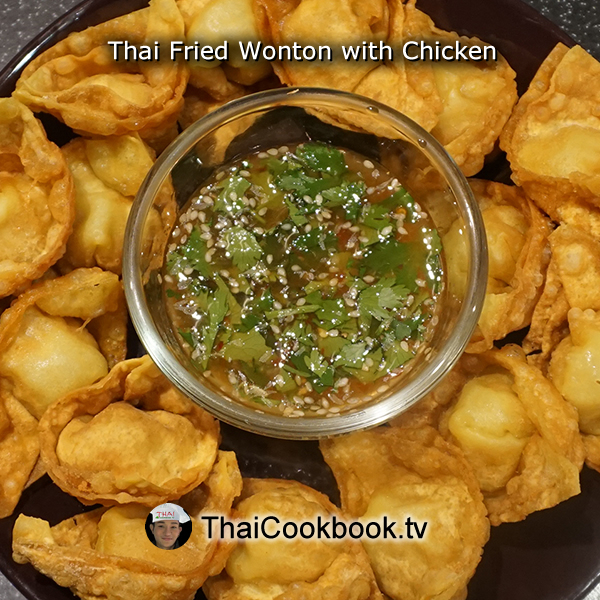 To make my Thailand-style fried wonton you just need some garlic, lemongrass, kaffir lime leaf, and coriander root. You'll need about 1 teaspoon of each, finely chopped. 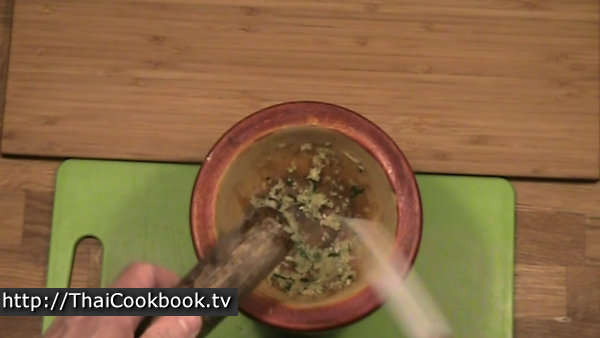 Next put the herbs together and use a mortar and pestle to grind them as fine as you possibly can. If you have a food processor that will work well, because you really want to grind up the kaffir lime leaf into tiny little pieces. 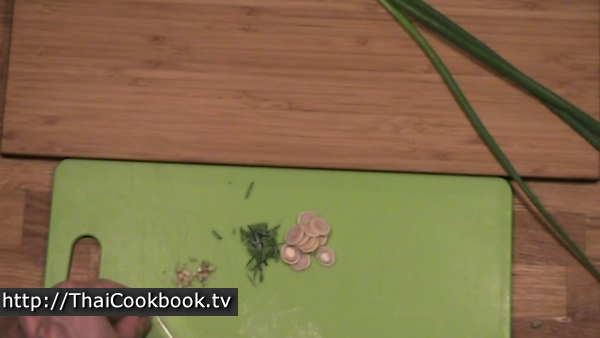 Add the herbs to the ground meat. 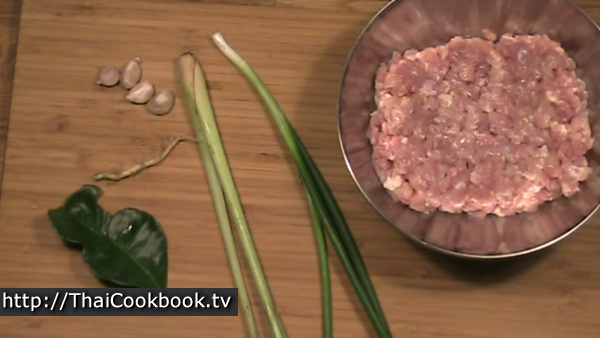 I'm using chicken this time but you can use ground pork or even ground beef if you prefer it. Add in the chopped green onion, tapioca starch, ground white pepper, fish sauce, and sesame oil. Mix it all up very well. 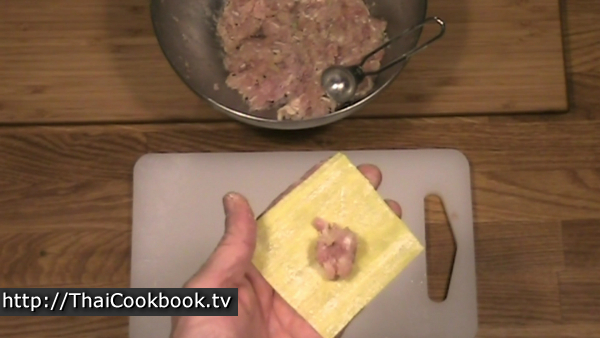 Take a wonton wrapper in one hand and add a teaspoon of the filling. It's important not to use too much or the wonton won't stay wrapped tightly. Wet the edges of one side of the wrapper with some water on your finger. Fold the wrapper over into a triangle, push all the air out, then seal it by pinching the edges together. Triangle shaped is pretty easy so you can just leave them like that if you want. I am not very good at doing the other shapes, but with some practice this one is easy enough. Push the two corners on the folded side together and roll the edges up into a boat shape. Wet the corners then stick them together. The trick is to get this done without tearing the wonton open. If you go slowly it gets easier and soon will come out fine. If it tears, just take the filling out, throw away the wrapper, and start over. Put together all the wontons you plan to fry before you start. I use a deep pot to fry in, but if you have a deep fryer that will be better. The oil needs to be just barely hot enough to fry, so start at about 150°C (300°F). Any hotter and the wrapper will burn before the filling is cooked. Fry slowly for about 5 - 7 minutes, stirring lightly. After frying for a while the wrappers will be crispy but you'll see that the filling is still frying and popping. If it is popping a lot that means there is still a lot of water in the filling and they are not cooked all the way. Let it fry until everything slows down a lot. Remove them to a wire rack to cool. 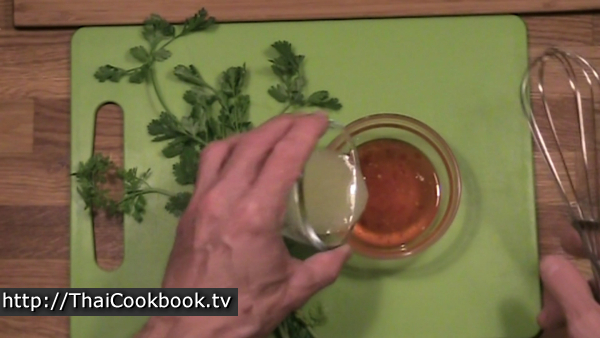 The sauce starts with some prepared Thai sweet chili sauce, the one we call Nam Jim Gai. You can make it yourself or buy it. Adding fresh lime juice will give it a nice citrus flavor and thin it down. Stir in the sesame seeds and let it stand until ready to serve. Just before serving, add the cut coriander leaf and stir it all up. 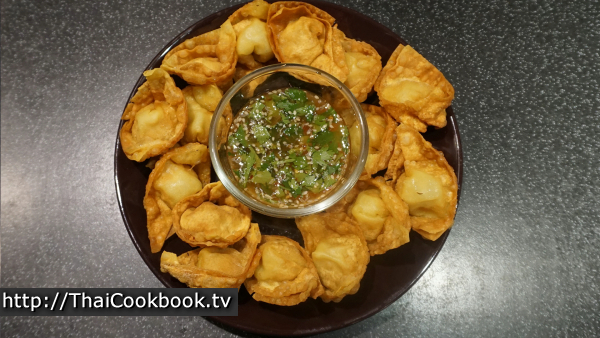 Serve the wontons on a big plate with the sauce in the middle.